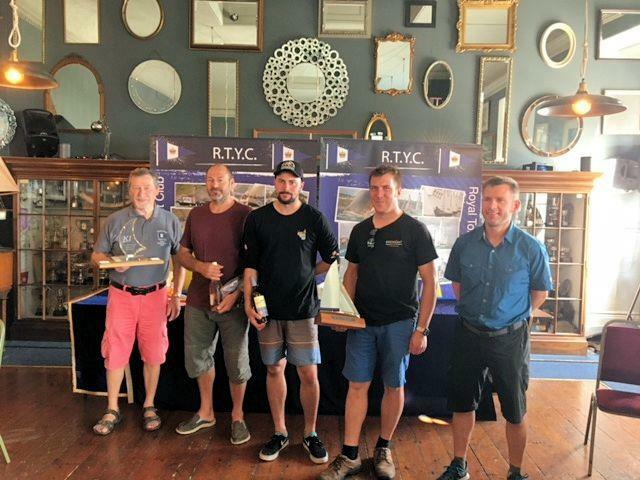 The Royal Torbay Yacht Club played fantastic hosts for the K1 National Championships between August 31st and September 2nd. With helms and boats coming from far and wide people started arriving a day early to be greeted by blue skies, sunshine and a gentle south easterly breeze. Ice creams and cream teas were the order of the day until racing started at midday on the Saturday. Principal Race Officer, David Rayment, had a choice of two courses for us competitors – a traditional triangle, sausage, triangle or a trapezoid. As the weekend progressed we had the benefit of sailing each course on each day – nice to mix things up a bit. Race 1 saw a very light south easterly tracking right. Some of us got it very badly wrong, took the left hand side, paid for it at the windward mark and never recovered from this fundamental error. Not so for Andy Snell who got his event off to a flyer with a bullet, followed by Tom White of Olton Mere where light and flukey winds might be the order of the day but wide open spaces and mixed up seas like Torbay certainly are not. With a slight sea breeze coming in and the wind still going right the windward mark was relayed and Race 2 got underway on the trapezoid course. Mike Commander of Teign Corinthian YC read the line bias best, got a pin end start and was able to cross the fleet on port. This time the majority of the fleet got the hang of things and went right up the course. Commander got chased down at the end of lap one and Paul Smalley from Chew Valley went on to get the first of his four bullets under his belt with Guy Woodhouse from Lyme Regis getting into his stride with a second. At the end of day 1 Smalley and Snell were tied on 4 points each. The blue skies and sunshine had gone for Day 2 and it was a rather warm, grey nondescript day but a more stable light SE’ly breeze. Three races scheduled for the day and the fleet was bolstered by five late entrants so we had twenty on the start line – well we did once class builder Jeff Vander Borght finished putting his new boat together! As Race 3 got underway it again paid to go right up the first beat. Snell led around the windward mark followed by Smalley and Commander and that’s how it stayed until the finish – only there was a sting in the tail for Snell as he’d been caught as one of four over the start line. Ouch! No hooter until Smalley crossed the line. This would prove to be a costly error come the end of the series. Race 4 saw Vander Borght of Lyme Regis SC join the party along with fellow club member Dave Guthrie both of whom were in the mix at the windward mark. Quite a few place changes occurred at the head of the fleet going down the two reaches. But come the end there were three familiar faces filling the top places – Smalley, White and Snell. The last race of the day, Race 5, again saw a trapezoid course and yet again it paid to go right. There’s a pattern developing here and White was clearly on a buzz as he led from start to finish. Uncharacteristically, Smalley was further back in the fleet in fifth going up the second beat but eventually finishing fourth. This would prove to be his discard. Day 3 saw just 4 points separating the top 3 who by the way are all newcomers to the fleet and going to be a force to be reckoned with going forward. The pin end was again favoured by the leaders in Race 6. Further back in the fleet just one point separated Woodhouse and Commander in fourth and fifth so it was going to be an important day for both. Smalley, Snell and Commander all had good starts and were able to tack over to the right and lead the fleet around the windward mark. It stayed that way until Woodhouse got back into the race up the second beat where he caught and passed Commander at the windward mark. A luffing match ensued going downwind with Woodhouse getting away only to leave the door wide open at the leeward mark and Commander sailed over the top as Woodhouse fell into a hole. So equal points for both going into Race 7. The pin end was again favoured with leaders tacking over to right. This saw Snell leading the way around the windward mark chased hard by Smalley and Commander. With White seemingly losing his grip on third overall he fought back down the run and passed Woodhhouse before the finish. The points were now really close for 3, 4 and 5 with Commander just two points adrift of third placed White and three points clear of Woodhouse. So all to play for in the last race to clinch the last podium place. Meanwhile Smalley was sailing home having clinched the championship with a race to spare! So no Paul Smalley to worry about in the trapezoid of Race 8. Snell took advantage and was first to the windward mark followed by a gaggle of boats including a new face, Gordon Keyworth of Wimbleball SC. No place changes down the first reach but some roll gybing down the run by the lead protagonists saw Keyworth fall to the back of this group. In the light and dyeing breeze there were no more place changes. Woodhouse got second, White third and Commander finished a distant fifth – so the podium places remained unchanged from day 2. But one of our greatest stalwarts in the K1, Alf Hawksworth, had his best race of the series coming home sixth. Special thanks go to the Torbay’s Race Officer, David Rayment, and to his mark laying team who were undoubtedly a lot fitter than when the event started – they moved the windward mark on the 2nd lap of each and every race bar the last. Heroic stuff. As was the horn blowing by the team at the leeward mark as they signified the course change. But possibly the biggest vote of thanks goes to the beach party crew who helped each one of us the slipway. Every time we came ashore it was low water and the slip seemed to get longer and longer as each day passed. Thanks for the muscle power! To all competitors not mentioned above: “thanks for coming”. Without you we wouldn’t have an event. The camaraderie in the boat park with everyone helping one another is great to see. Congratulations to our 2018 National Champion, Paul Smalley and to Mike Commander the Masters Champion. Yes, its back to Torbay for the Nationals, last time we were there we learnt a lot about how great a sea boat the K1 is! Roll on the Nationals!!! Mike Commander will be our ‘local’ contact.